It’s true that shoving cheese in your face is kind of the world’s best appetizer. Well, unless dairy makes you double over and wish you were dead. Then, it’s the world’s WORST appetizer. But for those of you who are gluten- and dairy-free, you already knew that. So I sorted out how to make the gfdf crowd feel like, “Whoooo! There’s a party!” without all the gas. DONE. I will admit that I kind of shoved the pesto pizza all up in my mouth before anyone else could get it. Sorry everybody, but that Kinnikinnick gluten-free dairy-free pizza crust right out of the oven? Damn, it’s crispy. The pesto spread makes it super flavorful and dunking it right into the marinara makes it the perfect appetizer. Saddled up next to that magic are the Schar’s Italian bread sticks (gfdf, natch) wrapped in proscuitto. Yes, Italians can still eat gluten- and dairy-free, my friends. And eat well. What’s that next to tha’ sticks? Sure, you may say popcorn is easy peasy, but this is a very special popcorn. Popcorn Indiana makes a sriracha popcorn (gfdf, see a pattern?) that you could probably sort out how to make yourself, but hey, buy it and you have more time to relax before the par-tay. And finally, that hunk of char you see up there is actually a super delicious cauliflower bake. 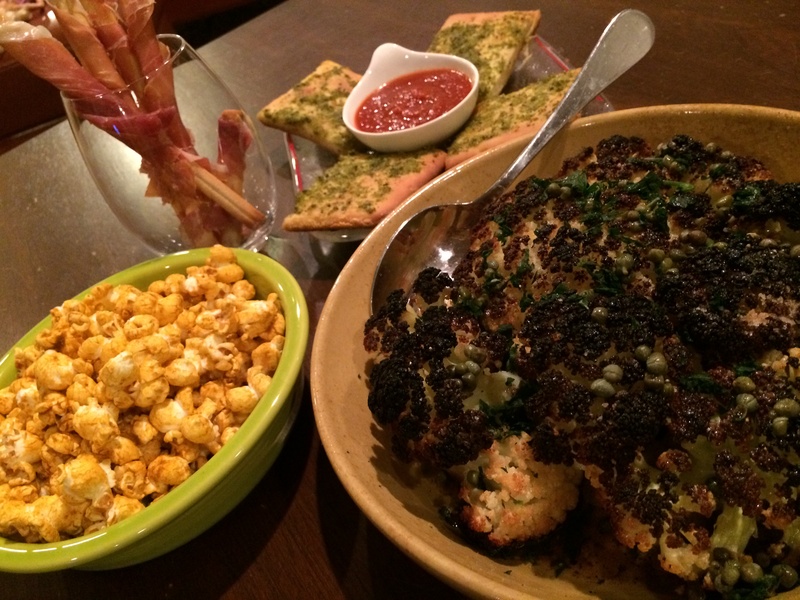 I’ve been seeing all of these recipes for roasting up a full head of cauliflower and I tried this one. The recipe says to roast it for an hour to an hour and a half, but it was so charry after 45 minutes, I just had to pull it out of the oven. It was good. Dang good. And guess what? GFDF, mother scratchers! I’m realizing that olive oil is playing a key role in all this business. And that’s cool. But here’s a note: If you’re cooking something, use olive oil. If you’re making a dressing, not cooking with it and using it to season, use extra virgin olive oil. That’s the dealio. The thing about throwing together (or purchasing at the store) these awesome appetizers is this—it’s made me realize (even more) how easy it is to make your sensitive guests happy. I mean, I kind of got it back when I went from the life of the party who would eat, drink, smell anything to the girl who was like, “Ummm, what’s in this?” 28 times a night. But actually giving myself these challenges in the “What’s Your Damage” series just makes it even more clear. It’s also clear that soy is in freaking everything!!! Paleo is kind of the only allergen-free way to live, right? OH, unless you’re like this girl I just heard about from my waiter at Picca (very g-free friendly) who not only has celiac but has this weird thing that meat protein is as easily digestible for her as PLASTIC. Holy. So yeah, more “damage” coming and I’m really excited to try on some more options for the challenged. In the meantime, you guys, eat this stuff. It’s safe (if gluten and dairy are your only enemies) and it’s rads. Tags: dairy-free appetizers, dairy-free recipes, gluten free, gluten-free appetizers. Bookmark the permalink. I LOVE the Kinnikinnick pizza crust. It’s the only store bought one I’ll buy.